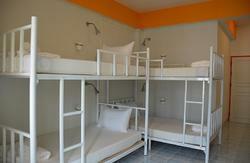 We offers mixed dorm room, girl dorm and also private dorm, with air conditioning. Guests who stay with us will enjoy free breakfast serving from 05:30-10:00hr. Free wifi, linen and towel are provided. For guests who just make a stop over in Chumphon for few hours, Salsa Hostel offers a very special day-use rate for 4 hours. Guests can enjoy using facilities at the hostel, taking shower, free wifi, etc. Sminh Bar is also located at downstair. It offers wide range of beers from different parts of the world as well as non-alcoholic drinks and snacks. -Key deposit (200/person) is required upon check in and will be fully refunded upon check out. -The housekeeping team will clean the room from 10:00-15:00hr, please keep belongings in order. -No lock out, no curfew. After 24:00hr, guests can use the back door to access the hostel. -After 24:00 (mid night), the rooftop terrace will be closed and will be open again at 06:00hr. -the Hostel is under 24-hour video surveillance. From Chumphon Train station: walking straight towards Krommaluang road for about 450 meters, Salsa Hostel is located right on the left hand side. From Chumphon Night Market Minibus station: take the exit to Krommaluang road, there the hostel stands right against the station.